You have, no doubt, heard that water always follows the path of least resistance. The teaching here isn’t so much that you should follow the path of least resistance -- that you should change yourself so to avoid as much resistance as you can. Rather, the teaching is: we always do follow the path of least resistance – as inevitably and unavoidably as water does. If you think you’re taking a path of greater resistance by heading right over that boulder instead of under and around it, it’s only because there are bigger boulders, or the banks of a ravine that are directing you that way. So ask yourself: what are those resistances, internal or external, that are directing your path? Even Don Quixote – the fictional character of Cervantes’ novels -- is taking the path of least resistance if we take into account all the resistances at work. The good Don is still with me – a companion voice I carry around – though I am not as smitten with him as I was. 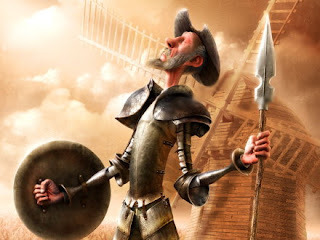 Quixote believes he is nobly taking on the path of most resistance -- fighting against “the system,” the establishment, City Hall, dreaming that impossible dream, refusing the quiescent, easy, submissive path. Quixote is able to believe that because he isn’t very self-aware. He has fixated on certain conceptions of nobility and principle, and he’s very attached to those conceptions, and rejects every part of himself that doesn’t fit his predetermined picture. He’s at war with himself, and in the name of his conceptions he’s ready to fight, vanquish, slay. He has erected huge inflexible banks of a story about what nobility and principle are, and he’s prepared to kill in compliance with their dictates. He’s not avoiding a path of least resistance; rather, he’s following the path of least resistance, given those huge resistances at work in him. He’s not mindfully attending to what’s there, but pouring all his energy into sustaining his delusion. "His brain," writes Cervantes, "dried up." The lesson of water is not: change yourself so as to take the path of least resistance. The lesson is: you already do so, so notice what the resistances are that are directing you on the path you’re on. Look at them with openness and curiosity: what’s at work here? Where did that come from? When we gain a greater self-awareness of our resistances, some of them soften up a bit. New paths start to open for us because we aren’t so fixated on our prior conceptions. It starts to feel freer, more able to be fluidly creative in the moment – life begins to feel less like white water through a narrow gorge and more like a smoothly flowing river. On the social and ecological level, we confront the same need – the need for awareness of the flow. We turn on the faucet and out gushes water, for less than a penny a gallon. Where is it coming from, guided by the resistance of various pipes to flow from our spigot? This is part 2 of 5 of "All Dried Up." Next: Part 3: "Mind the Flow"
Previous: Part 1: "Flow Like Water"